Lee 90576 New Lube & Size Kit .339 Diameter Sizer Die|Punch|Case 7|8x14 Threads in. Lees Lube Size Kit allows you to lubricate and size cast bullets. It can also seat and crimp gas checks. 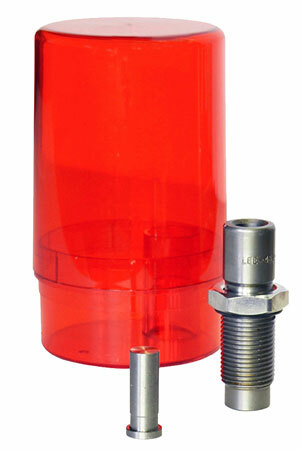 Intended for use on single stage presses only the sizer die has standard 78 x 14 threads. Bullets are pushed through the sizing die nose first so no special nose punches are needed. Push through punch is used in place of a shell holder in the ram. Sized bullets are captured in a special container. For cast bullets select a sizing kit to be .001 larger than groove diameter. Kit contains sizer box sizer punch and sizer die and instructions. NOTE Lee Liquid Alox and press sold separately."